It seemed liked it was written in the stars as Hui ‘Aumākua dominated the field throughout not only the Big Island, but the state of Hawai’i! 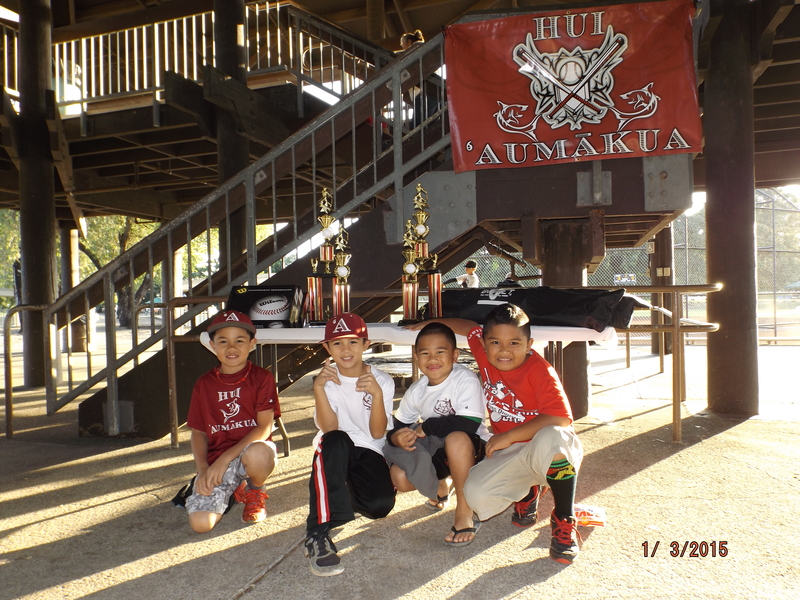 We’ve seen the hash tags on Face book and Instagram and heard it throughout the league, but really, “Year of the Hui”! We preached it, and it happened! 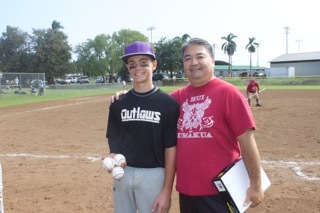 Hui ‘Aumākua dominated baseball on the Big Island for the year of 2015! Through the guidance and leadership of an organization built on Loyalty, Commitment, Dedication and awesome families that believe in the culture that has been created before them, it all came together in the end with a dominant year on the Baseball Diamond! Where to start? 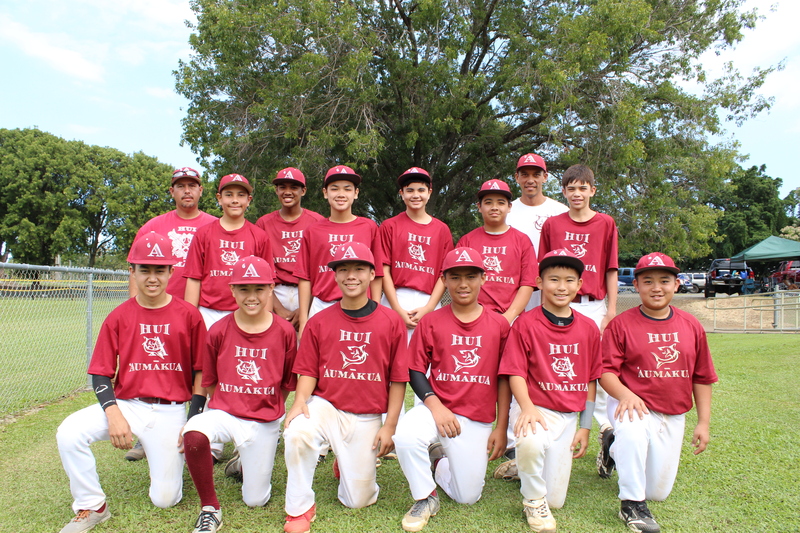 Hui ‘Aumākua came out with a bang in the first round as it swept each division and then claimed the first round championship in all divisions entered! The Pinto and Mustang teams were led by Coach Shon and his staff in claiming the first round titles! Coach Chris Honda and his staff dominated the first round in the Bronco division, while our Pony team claimed the first round title under the guidance of Coach Grant and his awesome staff! By winning the first round, all of our teams were guaranteed a spot in the overall championship game at the end of the season! Our Bronco black team was there in the hunt finishing a respectable 3rd in the first round! The bulls’ eye was now on our backs as play began in the second round! Our Mustangs had an exciting finish as they suffered their first loss of the year in the undefeated game in the 2nd round tournament to BPono! 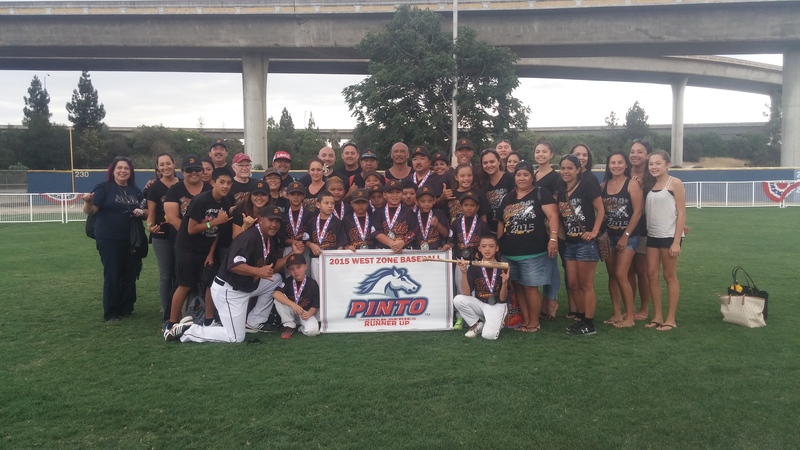 That made the road a little longer to the championship, but Hui prevailed in the end by beating Wreckers, then BPono twice, with the final game being a TKO 13-3 to claim the Hilo Pony League Mustang Title! What a season! Our Bronco Red team continued their dominant ways as they finished the year undefeated and trouncing H.I.A in the finals in a TKO! What a year for Coach Chris and his team! Hui Black was a run away from a possible all Hui final, but lost to H.I.A in the semis! Great run for the young guns as they finished in 3rd place! Our Pony’s, which is our oldest Hui team, had an awesome run! With no expectations coming into the year, this bunch made it to the final game of the year! They beat a tough Andrews Indians team for the second time in the semi-finals which put them in the championship game against Andrews Braves! Unfortunately, due to a schedule change and a couple of injuries, the game could not be played, and our boys took second place for the year! We are very proud of our Pony team! Great job Coach Grant and Staff! As for our Hui ‘Aumākua Babies, our Pintos, this group had high expectations coming into this 2015 season and boy did they live up to it!! They dominated the regular season Coach Pitch going undefeated and annihilated BPono in the championship game 20-1 to claim the Coach Pitch Title! They then moved on to the Player Pitch Series against BPono! They dominated that series by going 5-1 and claiming that Title! What a year for our Babies as they came away with 2 regular season championships! Great job Boys!! Aloha! Winter League is right around the corner! Please see registration forms below and submit to your coach or team representative! Mahalo! As the season came to a close, the excitement of All-Stars was in the air as all of our coaches prepared their post season teams for a run at States and hopefully a trip to the Mainland to compete for a World Series Title! What a summer it was! 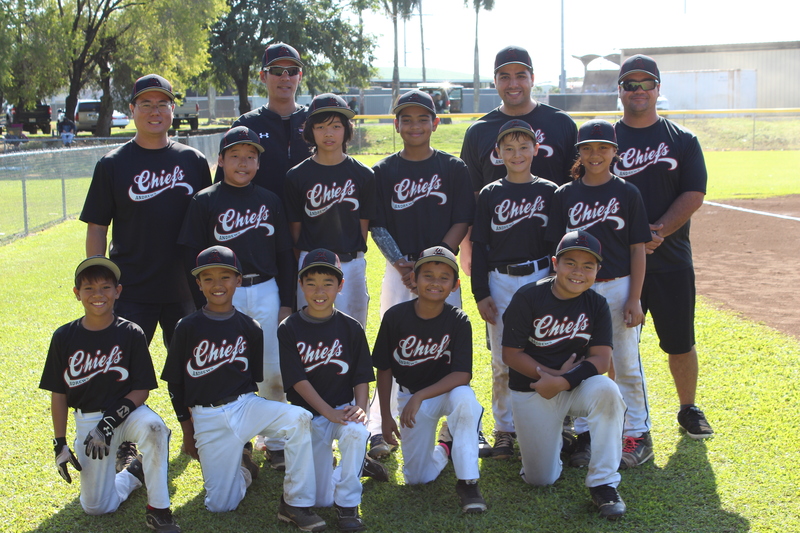 Coach Chris and his staff compiled 13 kids on his Bronco All-Star team, 10 being from Hui ‘Aumākua! 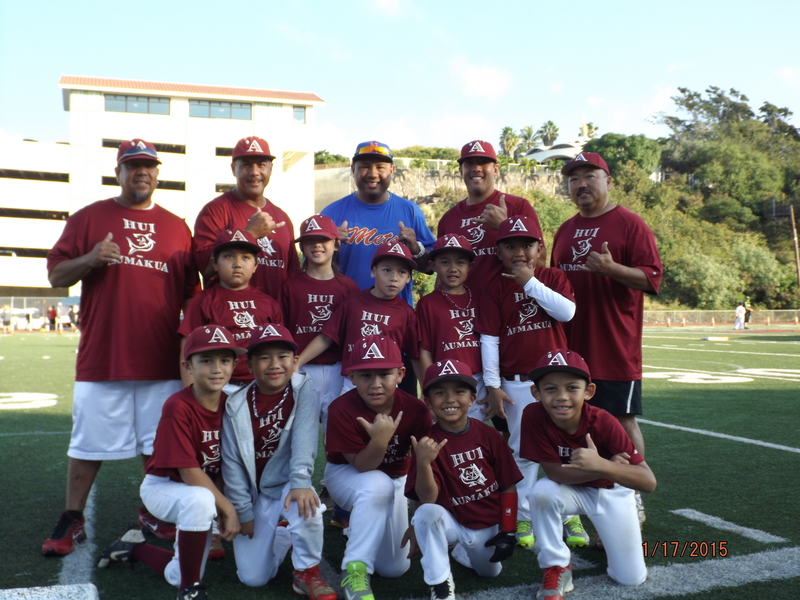 Coach Shon and his staff took a core of Hui ‘Aumākua kids that have had several years of post season travel to the mainland and combined them with role players from around the league on the Bronco 11’s! 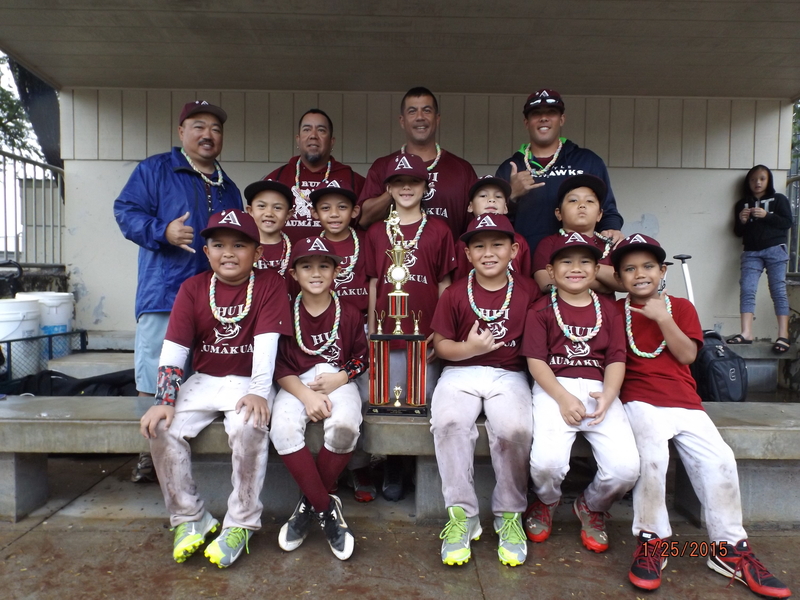 Our third Post Season team compiled 10 Hui ‘Aumākua Babies from our Pinto team along with 2 other kids from the league with expectations of a World Series Title! These Coaches and kids worked hard all year and preparation was key as they made a memorable run through the summer! 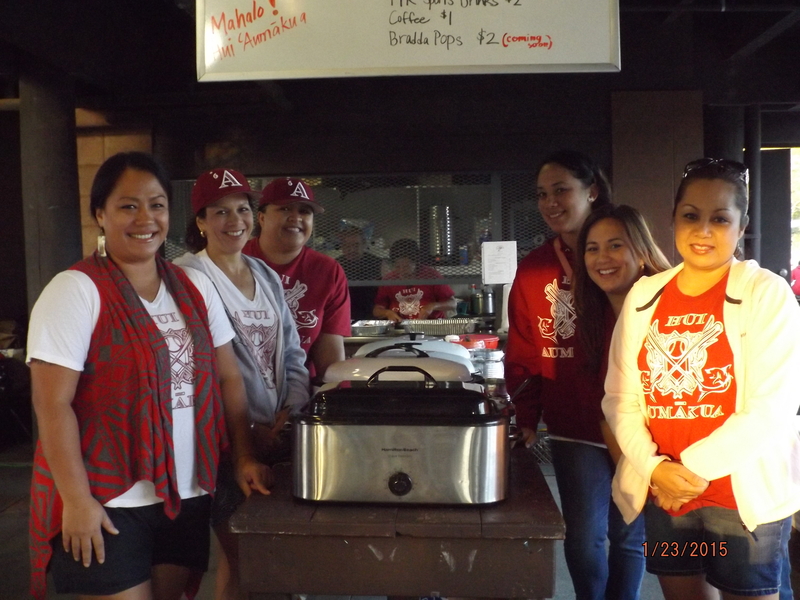 States was held in Hilo for the Bronco Division which is always an advantage for the home team. Our Bronco 12’s were prepared and boy they came out firing as they went undefeated in our Hometown and closing out Windward in the championship game with a TKO! The goal was no secret as these kids wanted to win the Region and board a plane to Southern California! The goal was met, as lot of these kids had never played in the mainland and the excitement of playing in California awaited them! Our Bronco 11’s had a different perspective on Post Season! Although we had some experience, we had a lot of first time All-Stars which kept Coach Shon and his staff realistic about winning States! We honestly had no idea what was going to happen! We went in with the attitude of playing our game and letting the chips fall wherever that may be! 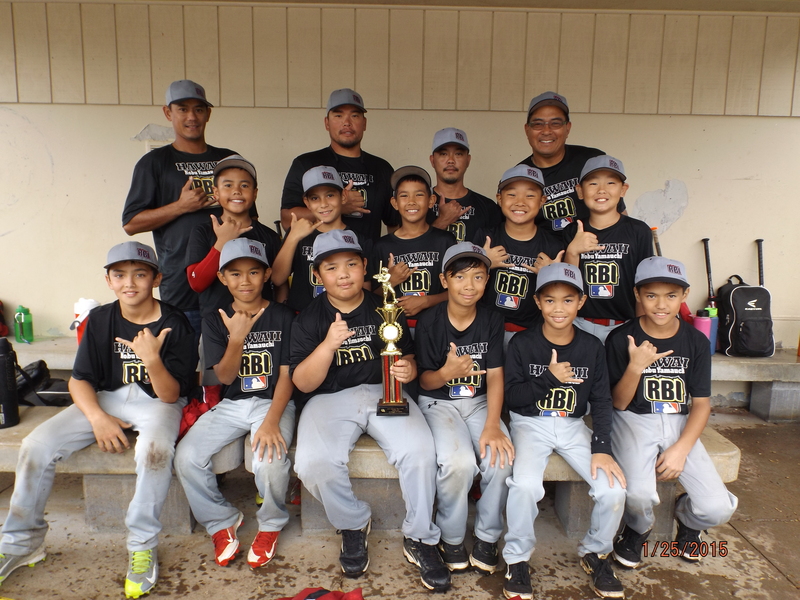 Our 11’s caught lightning in a bottle as they fought back from a lost to Mililani in the undefeated game and double dipping them on championship day in walk-off fashion to win states! 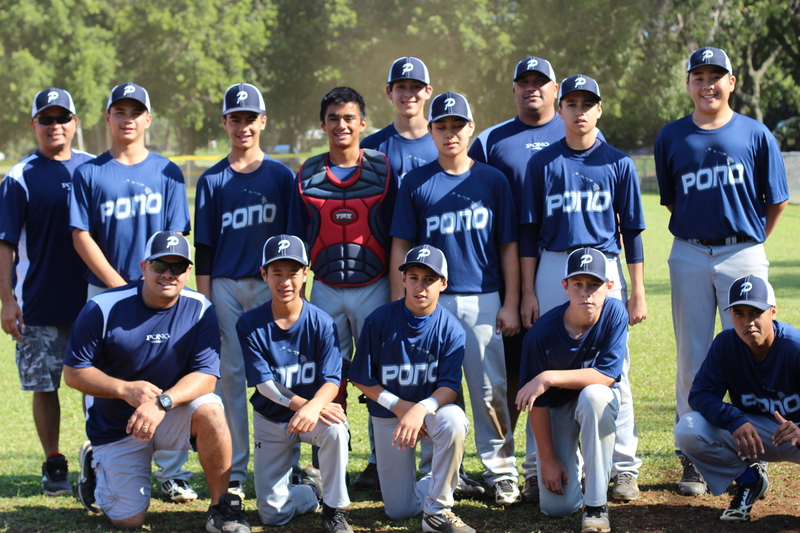 The following week, our Pinto’s boarded the plane for Maui in search of 2 state titles and a chance to represent Hawai’i in the Pinto World Series! 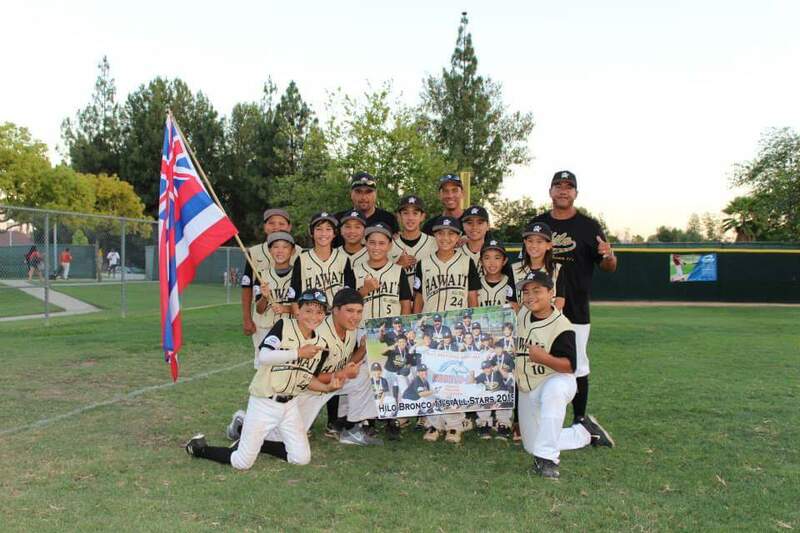 Our Babies took the player pitch tournament by storm in winning the championship against Maui! 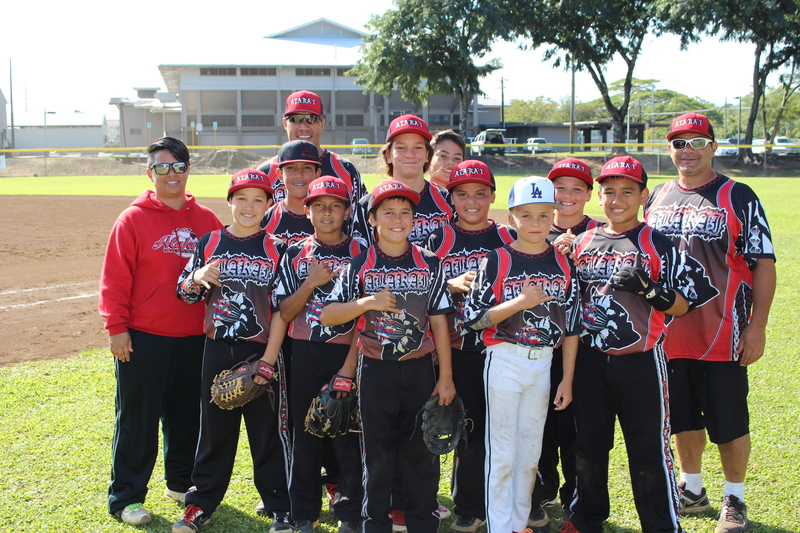 One day later, they adjusted to the coach pitch state tournament and 5 days later, they came away with that state championship by walking off “pre-tournament favorite” Waianae, for the second time and going undefeated in Maui! Our Pintos came away with 2 championships in a span of 10 days which has never been done before! Great job to all our coaches, families and players! Four STATE CHAMPIONSHIPS in one summer! Just straight up Awesome Gang!!! There was no time to rest as 3 days later, our first team to board the plane to California was our Pintos. 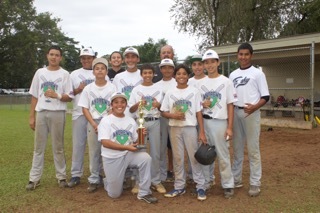 San Jose was the destination for the Pinto World Series! This group had a big following as we landed in San Jose ready to battle! Our Pintos came out right where they left off going undefeated in their bracket (3-0) and earning a spot in the World Series Championship against Southern California! The final lived up to the hype as it became a pitcher’s duel! After 4 it was 2-0 in favor of Southern Cal! The last 2 innings didn’t go our way as Southern Cal walked away with the Title! Our kids battled their tails off all year and 2nd in the world ain’t nothing to be ashamed of! This group will definitely make a few more runs at the World Series! Great Job Pintos! Our next team to fly to Cali was our 11’s! With no expectations for the summer, this group was just excited to be boarding a plane to Walnut, CA! A beautiful complex which half of our team has already played at when they were 9’s in representing Hawai’i! The tournament started off a bit rough as our 11’s came out with a loss to a much bigger San Francisco team which we played 2 years ago! Not to be outdone, we worked our way back in winning a couple tough games and got a rematch with San Fran 2 days later! Our kids were focused and their play showed as we won a thriller 4-2, and eliminated San Fran from the West Zone! We made it to the championship game of our bracket against Southern California! In the end, Southern Cal was just too tough as we gave them all we had in losing 12-5! This Southern Cal team eventually won the World Series Title a week later in Virginia! We were very, very proud of our 11’s as they overachieved and played as a “TEAM” and look where it got them! A lifetime of wonderful memories! Great Job 11’s! After almost a month of practicing and scrimmages, it was time to board the plane to sunny California and get it on for our 12’s! 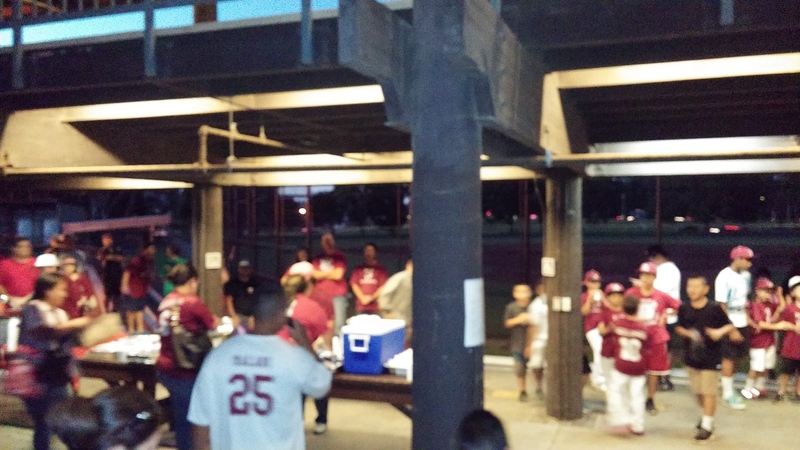 Our Broncos showed up at York field in Whittier excited and ready to play! They opened up with a tough game against East Long Beach and prevailing in the end with an important win! Winning that first one is always key! Their next opponent was a tough Arizona team that gave Hawai’i everything they had, but our boys pulled it out with a win and were sitting pretty at 2-0! The next challenge was the other undefeated team in Northern California! NorCal looked good from the get go as our Broncos made it a game in the end, but fell 6-3! There was no time to ponder the lost as Coach Chris had to rally the boys and get ready for Southern Cal right after that! SoCal is always considered one of the favorites in any division of baseball, and they proved to be tough as they gave our boys everything they had! Our Hawai’i Boys fought till the end, but just ran into some good pitching and the run came to an end! 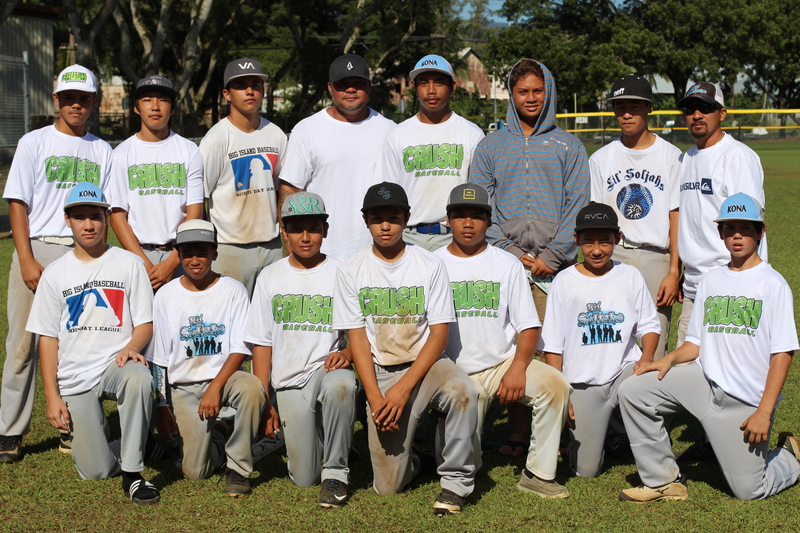 SoCal won 6-3, and ended the summer for our Hilo All-Stars! Coach Chris and his team had an awesome run!! From winning our Makahiki Hou Classic, to dominating the regular season, to winning Memorial Day Tournament in Kona and finally this memorable summer run all the way to Southern California! It was an experience of a lifetime for all of our kids and families! 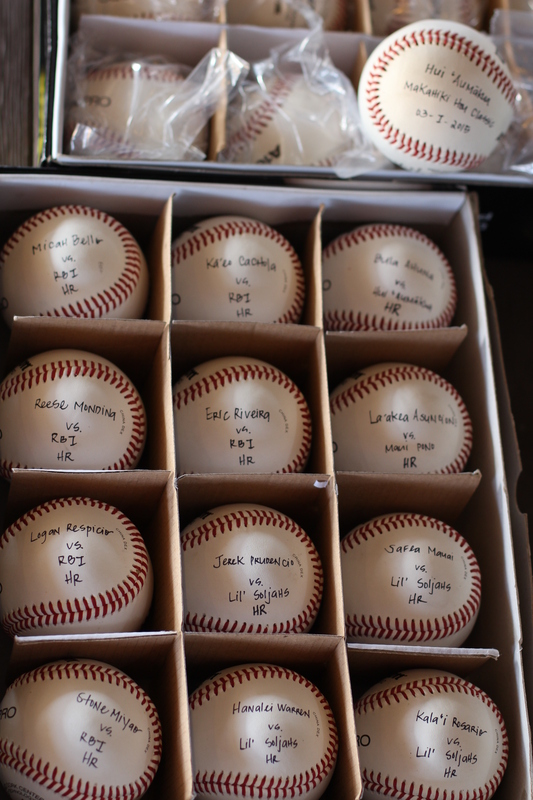 These memories are why we put so much into this great game of baseball! Cherish these moments as you never know if you’ll have an opportunity like this again! I would like to thank all of the Families, Coaches, team reps and especially our kids for providing us with the ride of a lifetime!!!! 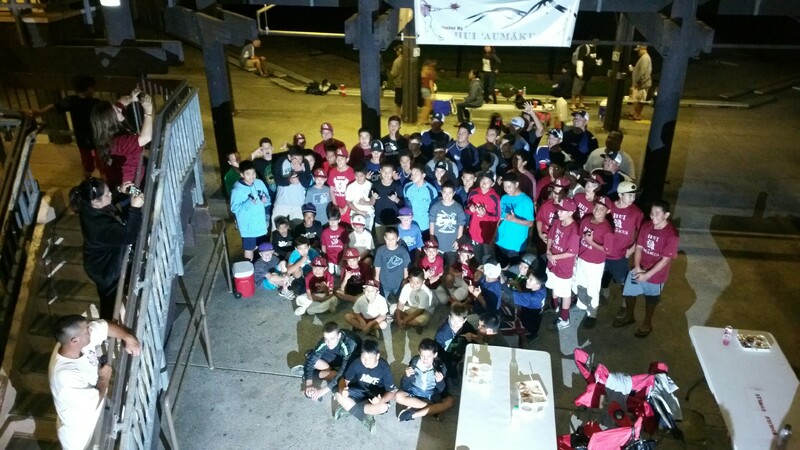 Great job Hui ‘Aumākua and hopefully we can do it again in the near future!! E Ola Nō! A Hui Hou!!!! Mahalo Sonny for the (c) design & Mahalo Mikey for the field cut-out!! 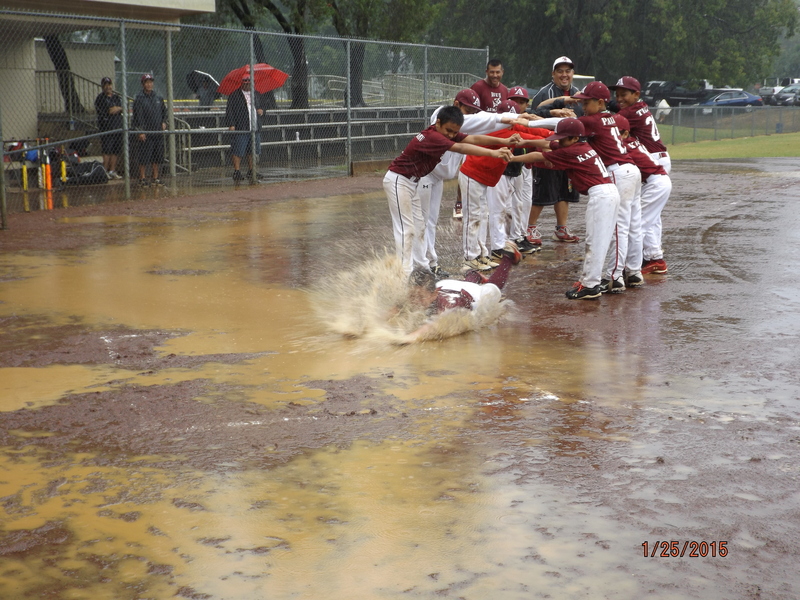 As we prepared at the end of the 2014 year for the Classic, we had new ideas in place for a better tournament which would benefit everyone from our keiki, families, participating teams and fundraising. This year we added a new twist which was comprised of running the Classic over a span of two weekends. Great idea, but one problem though, we had interest from the outer islands which would make things a little tougher on travel. “Not a problem”, replied one of our leaders, “We’ll make it work!”, and that we did! 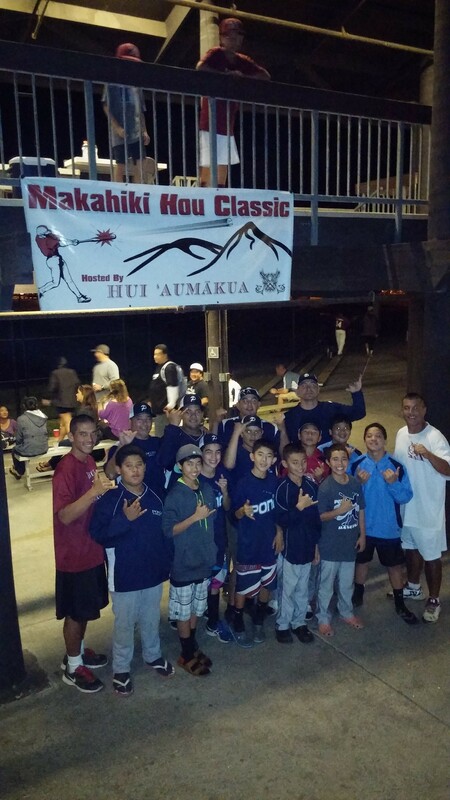 With all of the great leaders and wonderful ‘ohana that drives Hui ‘Aumākua Baseball, we were able to make it happen! 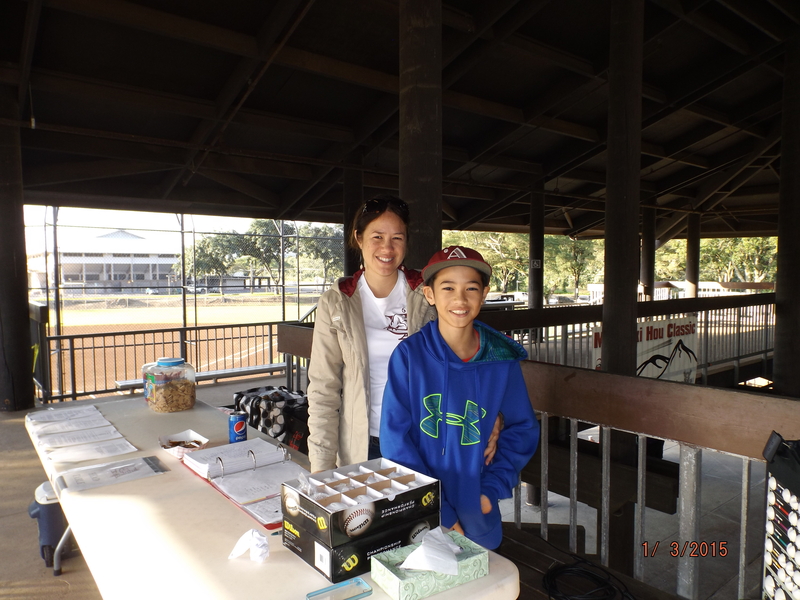 On January 2nd, we started pool play for the Bronco and Pony divisions. We were blessed with beautiful weather and great baseball. 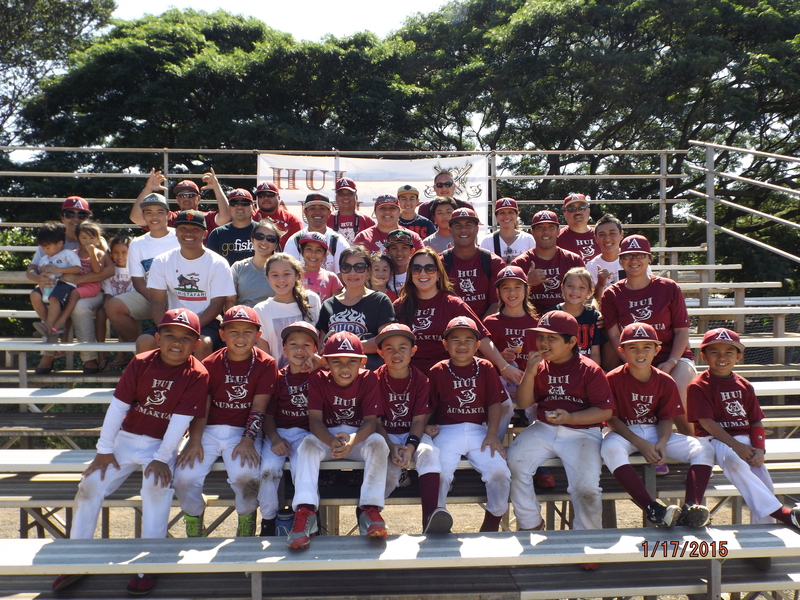 We welcomed Maui’s Pono Baseball and Outlaw Baseball from O’ahu (Aiea) as they stepped off the plane that morning and showed up to the field to showcase their talents and that they did! Maui entered teams in both the Pony and Bronco divisions while Outlaws competed in the Bronco division. 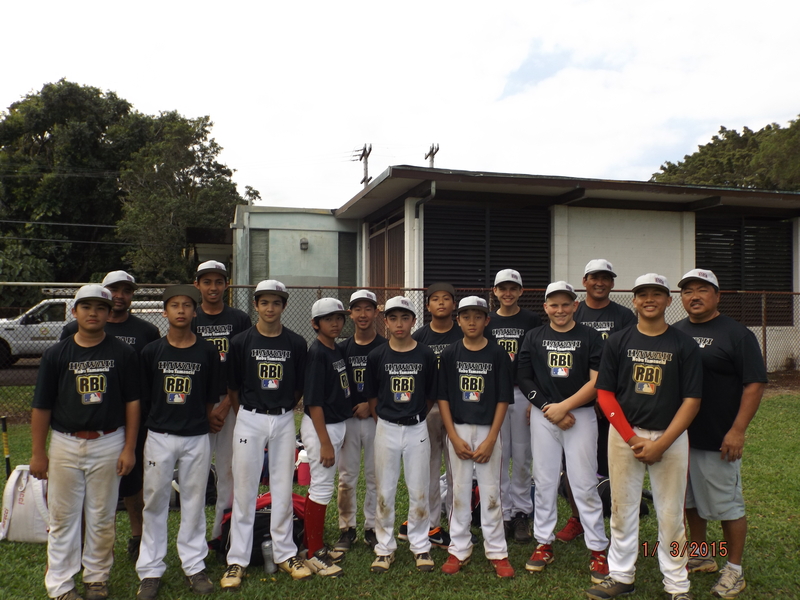 To round out the Pony, Bronco, Mustang and Pinto divisions, we also had teams from all over the island which included Lil’ Soljahs and Alaka’i from Kona, Elite from Waimea, and from Hilo, Andrews Braves, RBI Red, Andrews Indians, Andrews Chiefs, RBI, Lincoln Wreckers, Keaukaha, and don’t forget Da HUI! Pool play went smoothly as everyone got their 2 games done on Friday. Bronco Division – Outlaws in the Hale! Let’s do this! The championship round started on Saturday for the Bronco’s and Pony’s while the Mustang’s started their pool play on Saturday! As Saturday came to an end, the finals were set for a showdown between Maui and our own Hui ‘Aumākua in the Bronco Division, which could be a prelude to a summer showdown for the Bronco State Title which will be held in Hilo this summer! 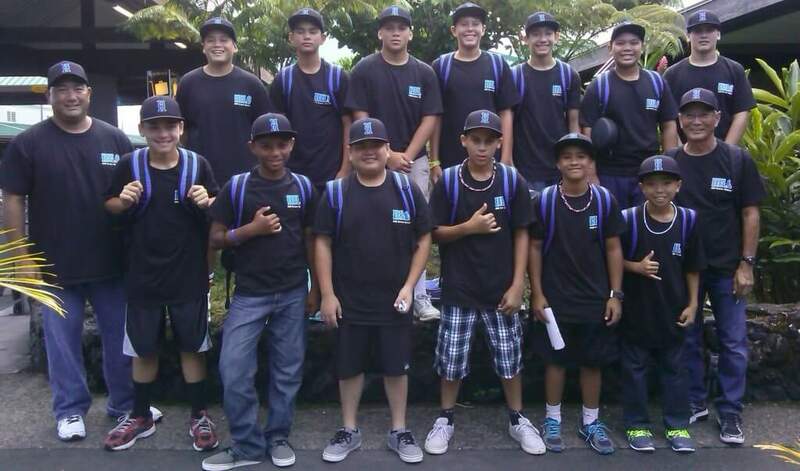 In the Pony division, Andrew Braves and Andrews Indians were set to meet for Bragging Rights in Hilo! 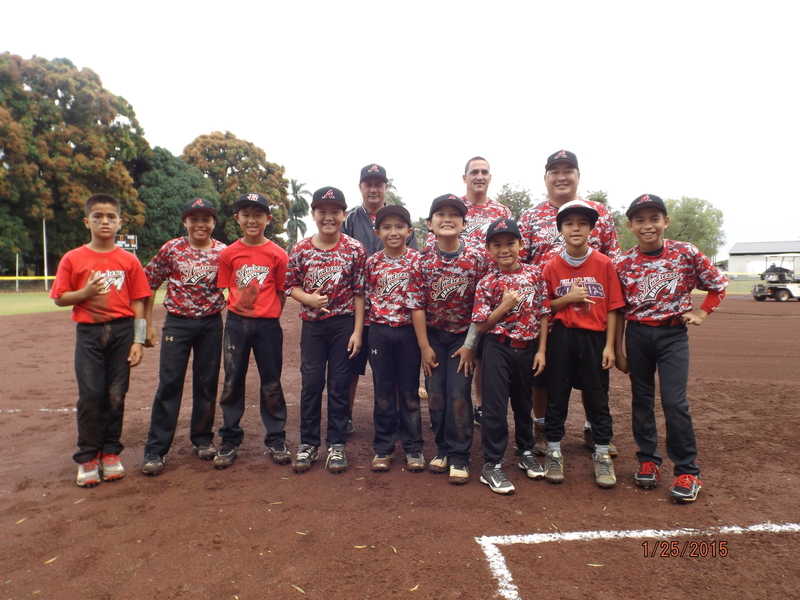 Our Hui Pony made it to the semifinals and fell in a great effort to Andrew Indians and played in the 3rd place game on Sunday versus RBI! Saturday was not done though! 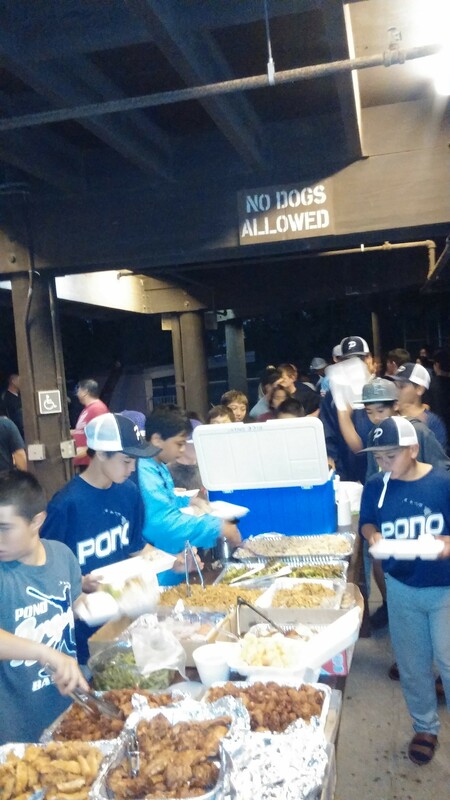 Through the great help of our families, coaches and various “silent” boosters we have, we put on an awesome spread for our Maui and O’ahu families and players at the complex! There was food for days as we had music, fellowship and memories for a lifetime. Big Mahalo’s to all that made that possible! Pa’ina! This is how Hui hosts our baseball brothers! Great time with our Coaches! Mahalo Coaches Grant & Shon! 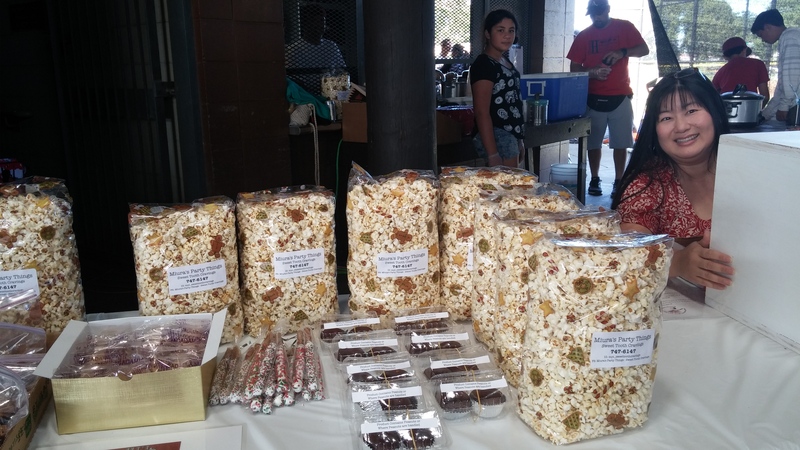 E Pule Kakou – Mahalo Auli’i! ONO!! Our Hui ‘ohana is the best! Sunday morning was upon us with the consolation, 3rd place and championship games to come! A lot of coffee and fried rice kick started our morning and let the games begin! In the Consolation games, Maui Pono came out victorious in the Pony division while Alaka’i took home the win in the Bronco division. 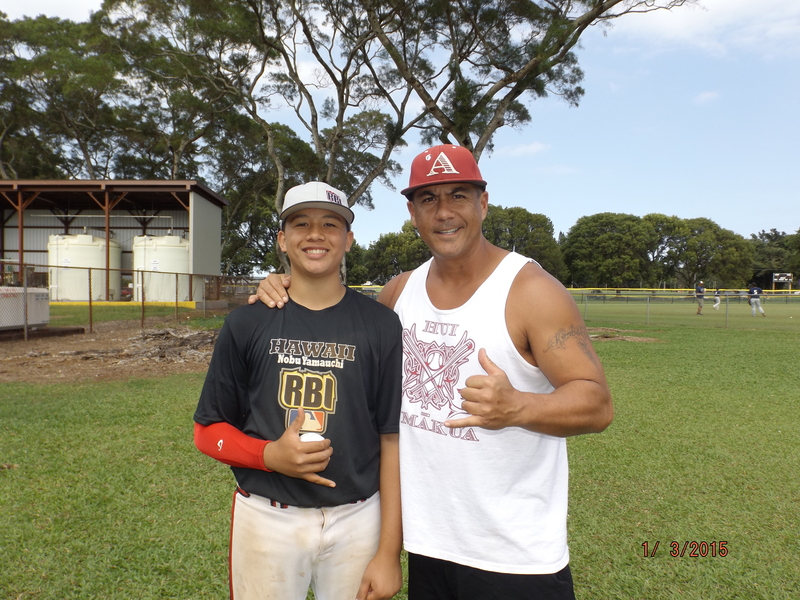 Our own, Hui ‘Aumākua Pony had an exciting game against RBI in the 3rd place game and came away with the victory! Great job coach Grant, coach Earl Jr. and staff! Looking forward to an exciting spring and hopefully, long summer! Go get um gang! 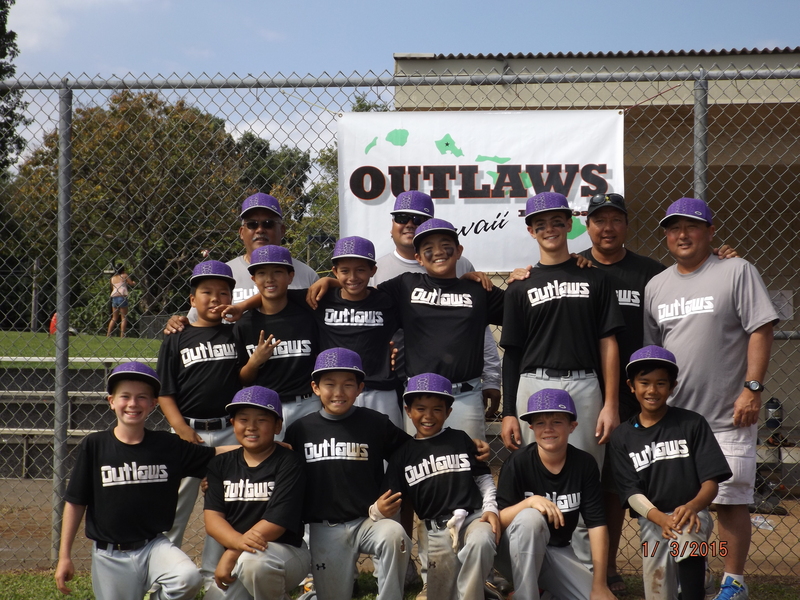 Outlaws showed their O’ahu pride as they came on during the tournament losing by 1 run in the semifinals to Maui Pono Braves and winning the 3rd place crown over Lil’ Soljahs. In the Pony Championship, it was a battle between the two Andrews, with eventually the older group (Braves), flexing their muscle en route to the title! In the Bronco Championship, it was an anticipated match up between Hui ‘Aumākua and Maui Pono and fans got what they wanted. The game of the tournament came down to the last pitch! Early on, Hui jumped out to a lead on a Grand Slam, but Maui creep back into the game and found themselves with the tying run on third with one out in the last of the 7th! 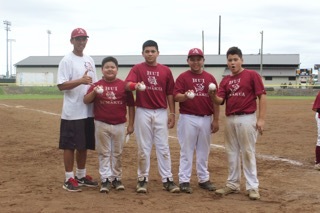 Hui’s pitcher came out with two, big strikeouts with curve balls to secure the title and keep the trophy home! What a game! Like I said, we might be seeing this same game in late June on the same field for a much bigger prize! Great job Coach Chris and staff for battling all weekend! Looking forward to an exciting time for the kids and families and it should be a memorable one! 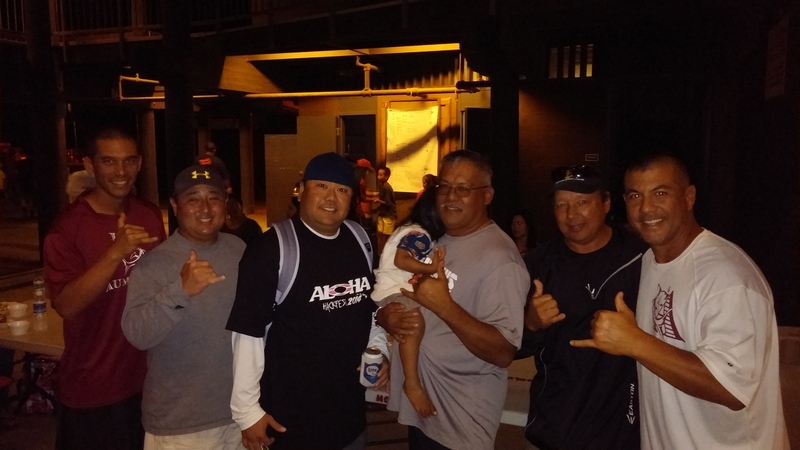 2015 Makahiki Hou Classic -Home Run Hitters!! Bronco – Pono – Represent! Bronco – Outlaws – represent! Much Mahalo to all the participants and especially Pono and Outlaws for making the trip to Hilo and being part of the Makahiki Hou Classic! 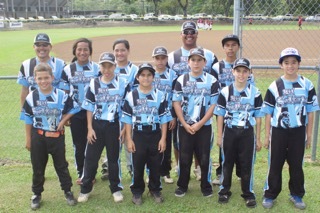 Also, we thank Orchid Isle Umpires for always being there for the kids and the game of baseball! We are already securing spots for a number of outer-Island teams for next year! It should be bigger and better! As for the Mustang division, pool play wrapped up on Sunday and the championship round along with the Pinto Championships will take place in a couple of weeks on January 24th – January 25th! A Hui Ho! 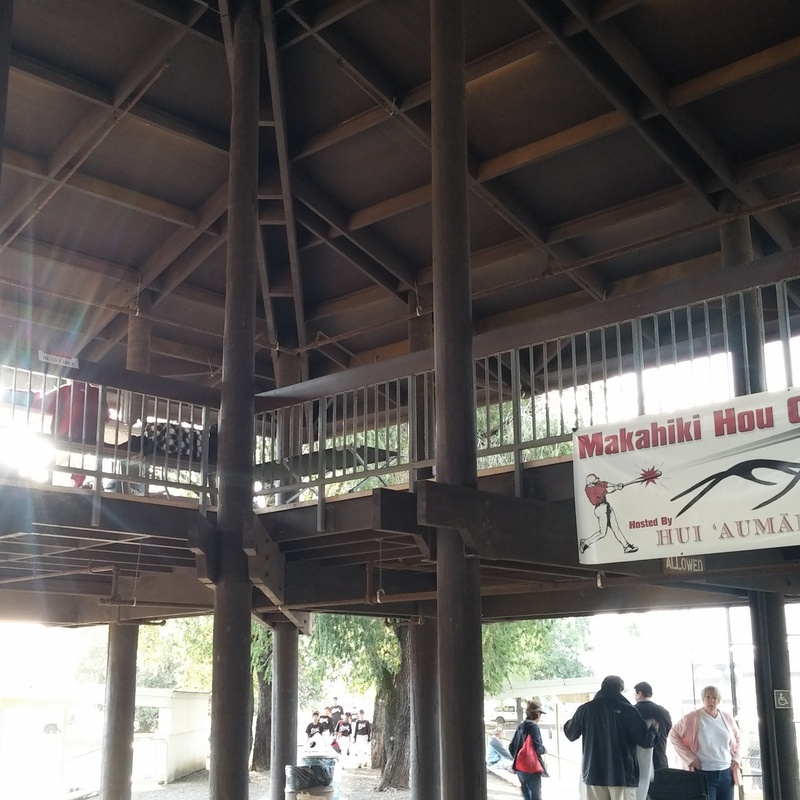 2015 Makahiki Hou Classic – Mustang Championships! Real time baseball game updates! 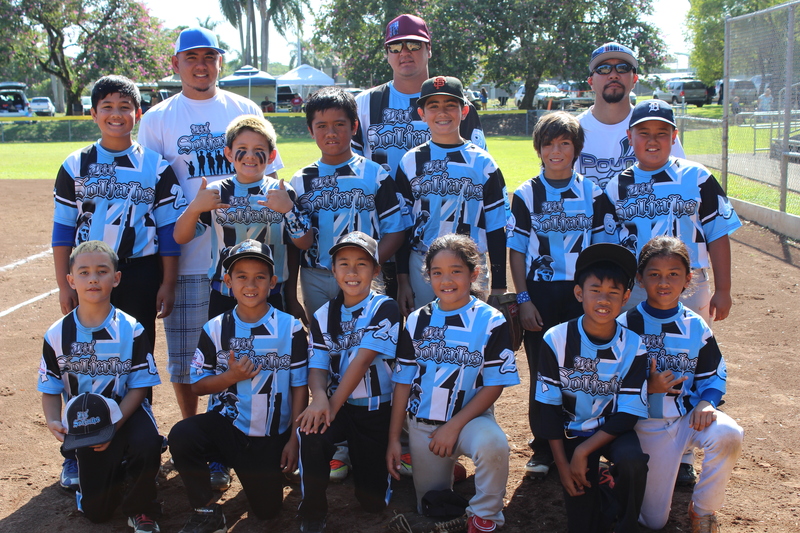 As our final weekend was upon us, the focus shifted to the younger keiki as the Pintos and Mustangs took to the field! We also had our younger Bronco team and Pony team playing on the Victor Pony field as they get ready in some goodwill games for the upcoming season! 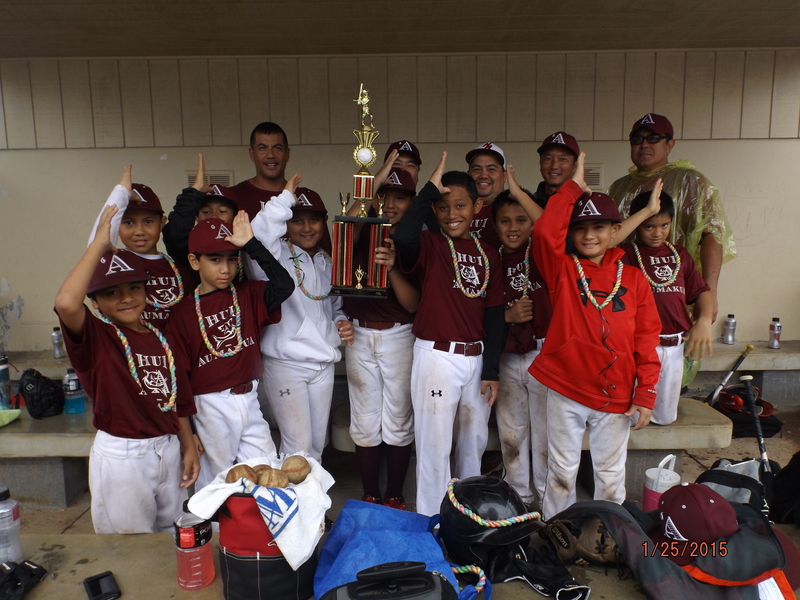 The weather was awesome as our own Hui ‘Aumākua Pintos, fresh off their awesome run through the St. Louis Tournament on O’ahu came out and started off the weekend with a bang as they took to the diamond on our very own Dreams Park! 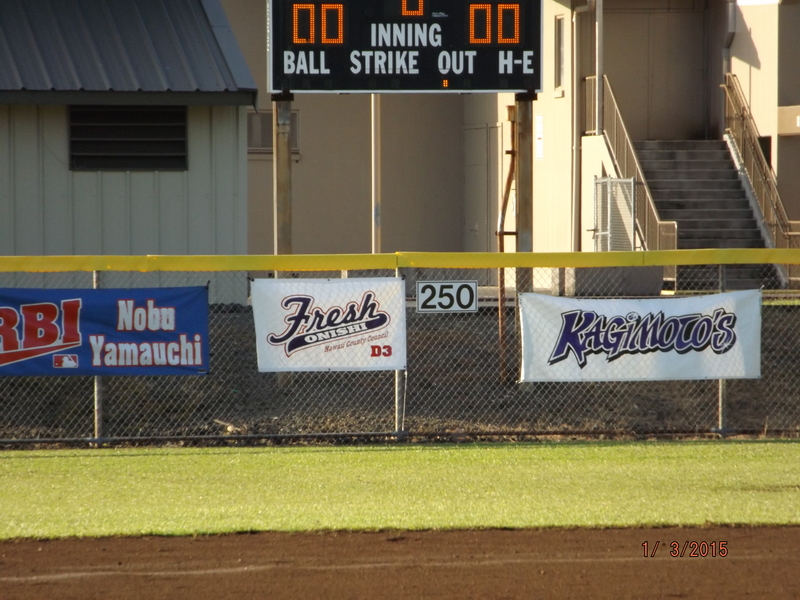 This year, we put up our own fence at 160’ and dressed up the field with banners and made it exciting for all the keiki! The Mustang Division took off in the morning as games became more intense as winners advance closer to the championship game on Sunday! Our young Broncos played a good game against Lincoln Wreckers as they work their way to regular season form! Saturday was in the books and what a day it was! We had a great crowd, with great food and great games in anticipation for the championships on Sunday! Rain was in the forecast as Sunday was upon us, and sure enough, RAIN! 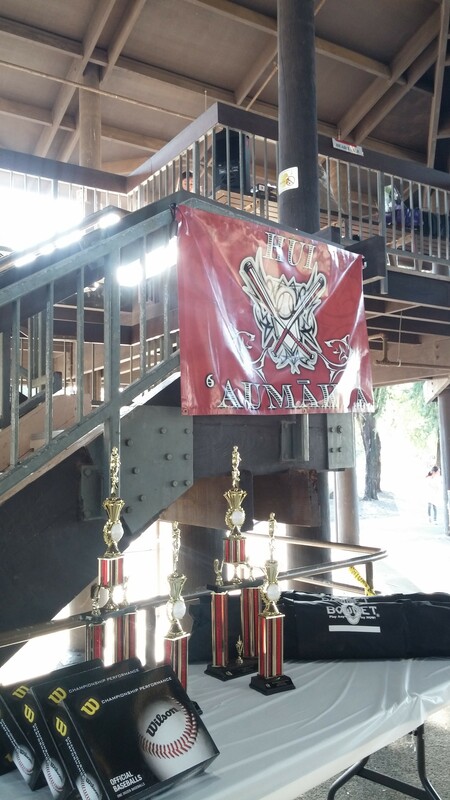 With the many great hands that Hui ‘Aumākua has, the games went on except the goodwill games on the Pony field! Between sponging, raking and more sponging and raking, we manage to make it a successful Sunday! In the Mustang Division, we managed to play the 3rd place game and Championship! 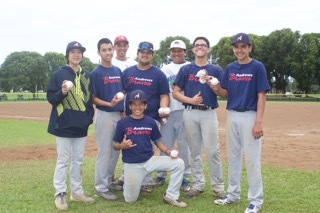 By tournament rules, the 3rd place game was a forfeit and Andrews Braves got the win. 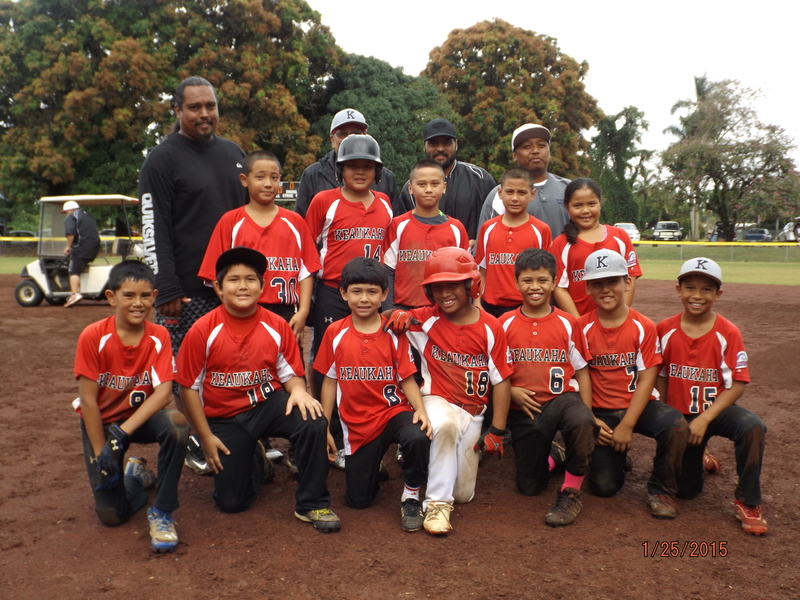 However, we replaced Lil’ Soljahs with Keaukaha, and Keaukaha battled Andrews to an extra-inning tie, 8-8! What a game! 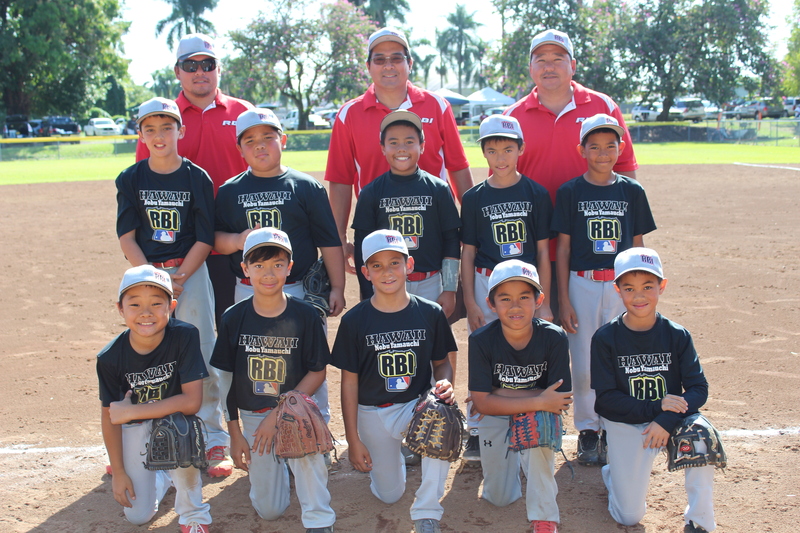 That set the tone for the championship game between our own, Hui ‘Aumākua and RBI! The crowd was ready, the field was dry and the teams were ready for battle! 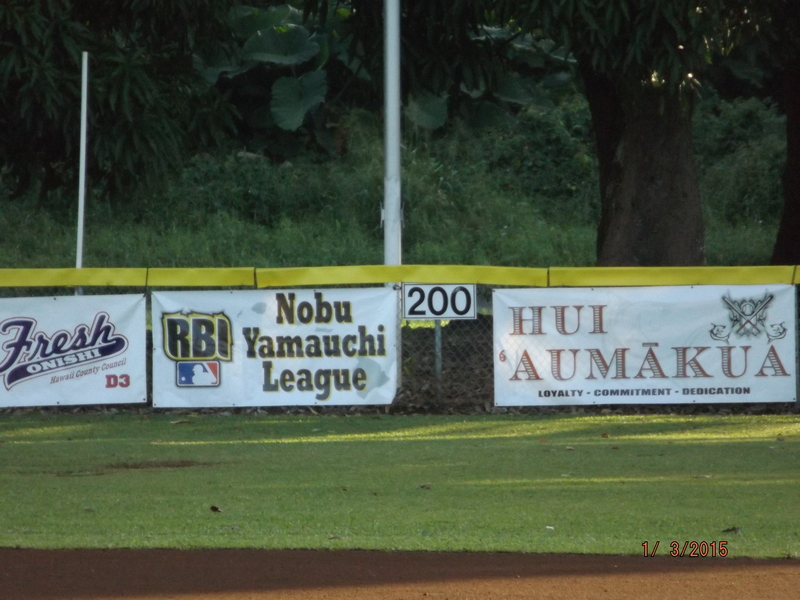 RBI came out tough, scoring 3 runs in the top of the first, but answering right back was Da Hui scoring 3 of their own! 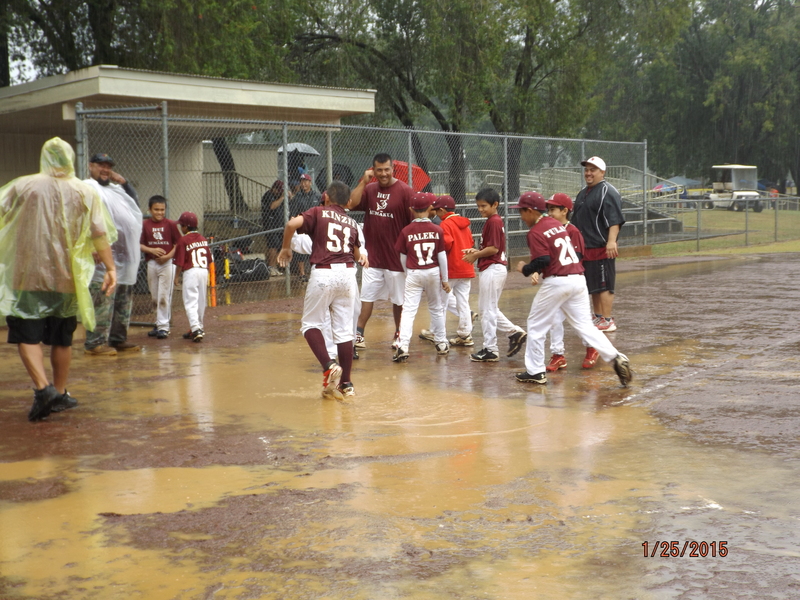 Hui ‘Aumākua’s defense settled down and their bats were just too much as they built a 10-4 lead in the 4th when the rain came again! 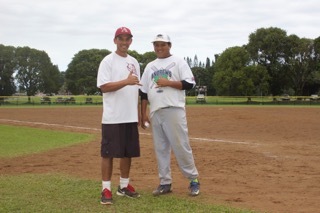 Because it was considered a complete game, the umpire called the game and Hui ‘Aumākua took the trophy home! Good job Boys! Taking his last run around the Mustang bases – way to go, Kedren! 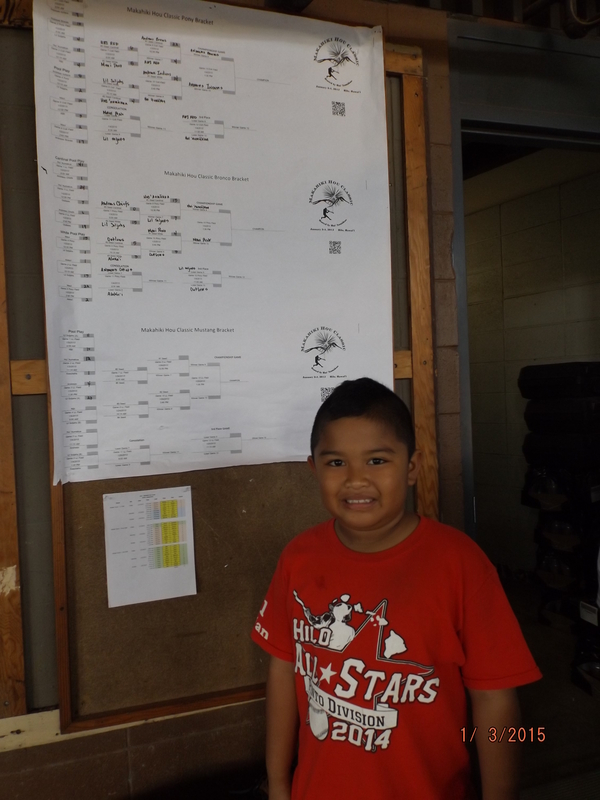 In the Pinto Division, Hui ‘Aumākua was sitting and waiting to see who their opponent was going to be in the Finals! Eventually the rain let up and Team Elite prevailed in the semi’s over Lincoln Wreckers and was ready to do battle with DA Hui! In the championship game, Hui ‘Aumākua’s defense was stifling, as they never looked back in the Hilo Rain and brought home the trophy, 27-0! Way to go boys and coaches! Focus on the task and let’s keep the train moving! What a way to start off the 2015 year gang! We planned, we worked and we played! Mahalo to all the hands that made all of this possible! Thank you to all the participants and good luck in your upcoming seasons! Thank you to my wife (Kimberly), for all of the behind the scenes work you do, none of this is possible without you! 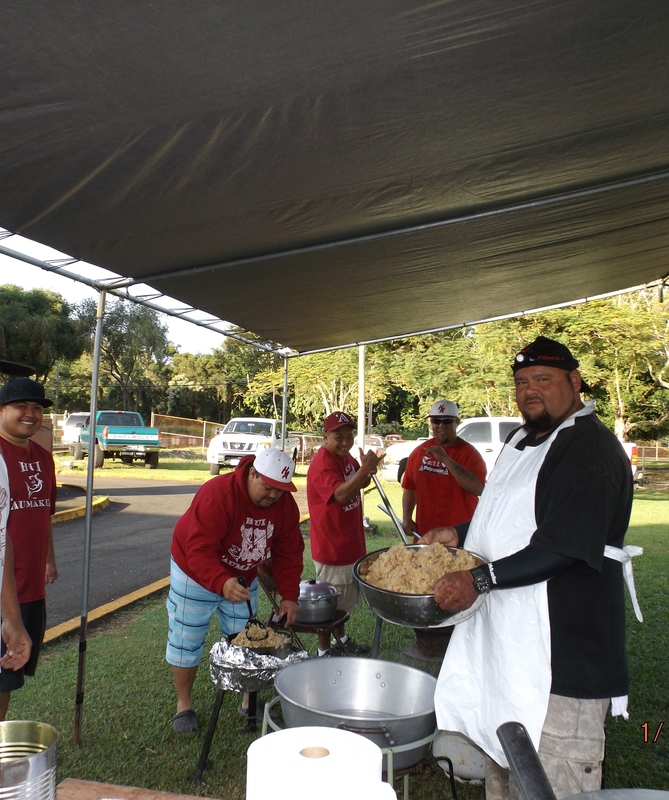 Thank you Board of Directors (Grant, Stan, Keaka & Clemente) and Hui ‘Aumākua leaders for all that you do! 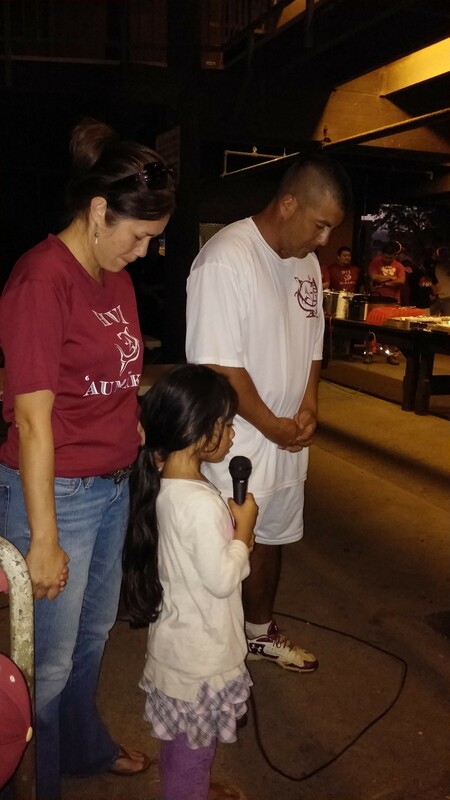 Thank you Solomon and Lily Malani for your endless support! Thank you coaches & team moms for the endless hours! Thank you Silent Boosters, you know who you are! 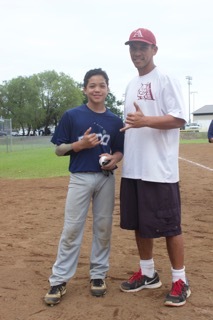 Keiki, keep striving for perfection on and off the field! Families, you know my motto, “Great Families make Great Organizations!” Remember our Core Values Hui ‘Aumākua faithful, LOYALTY, COMMITMENT, DEDICATION! 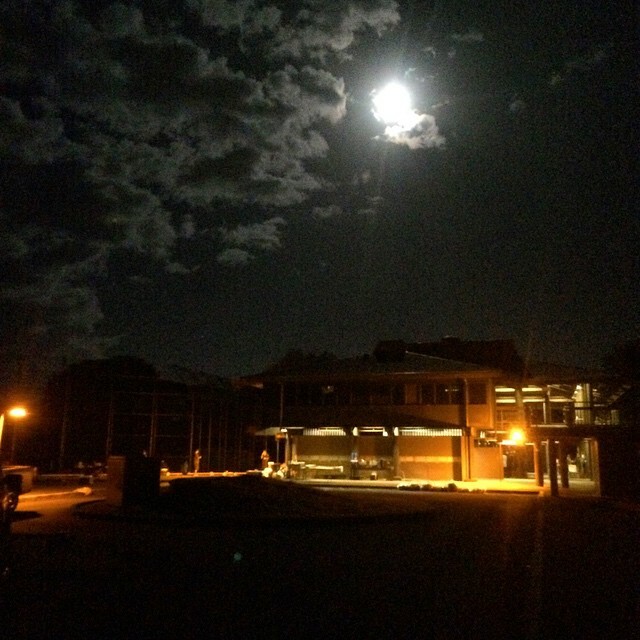 Just remember, there are no individuals in Hui ‘Aumākua! We all represent all of our teams from top to bottom. Good Luck to all of our teams for the upcoming 2015 season. We are proud of each and every one of you and let’s enjoy the ride! 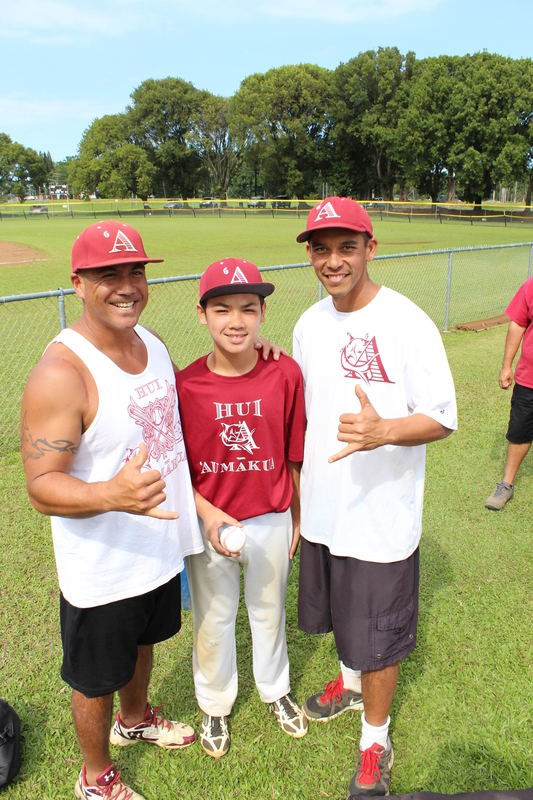 And last but not least, thank you Ke Akua for blessing us with the opportunity to give back to our ‘Ohana and Keiki through this great game of Baseball! 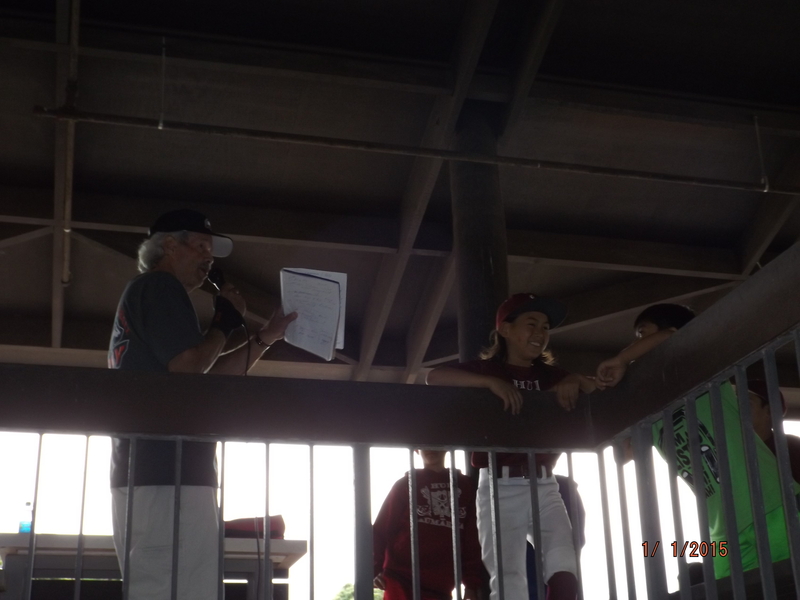 Mahalo umpire Mr. Pat Pacheco on the mic! 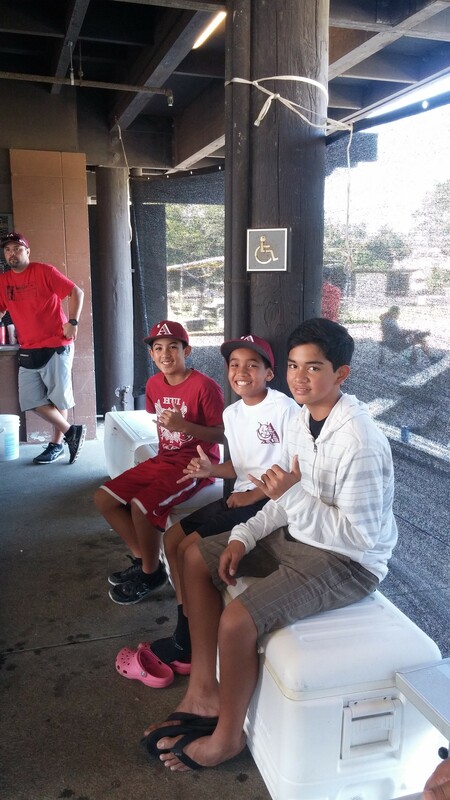 Mahalo to our older boys – concession help & field umpiring!! A Hui Ho!! 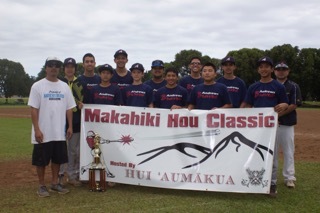 Eo e Makahiki Hou Classic!! Walk Offs – St. Louis Pinto Tourney – It’s a gr8 time to be a Crusader! 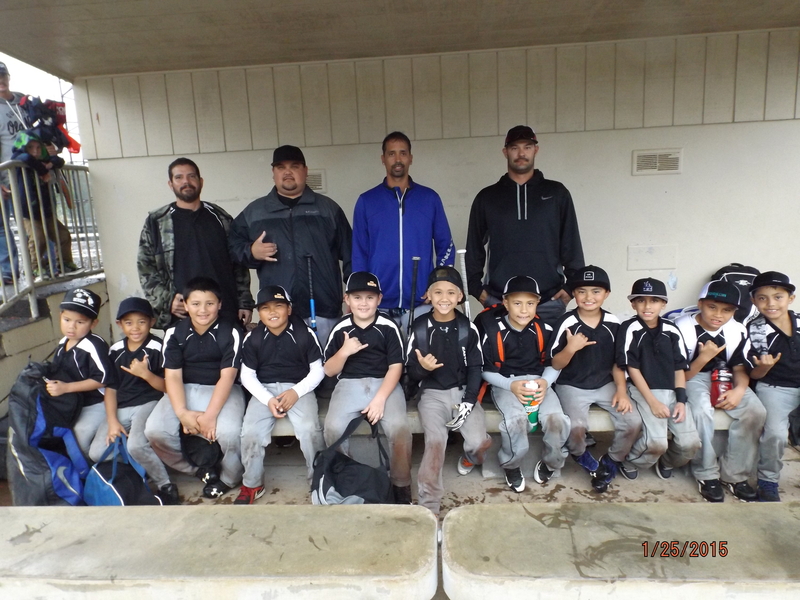 Hui ‘Aumākua Pinto Baseball returned from the St. Louis High School 8u Pinto Tournament going undefeated (4-0) in the “A” Flight Division! 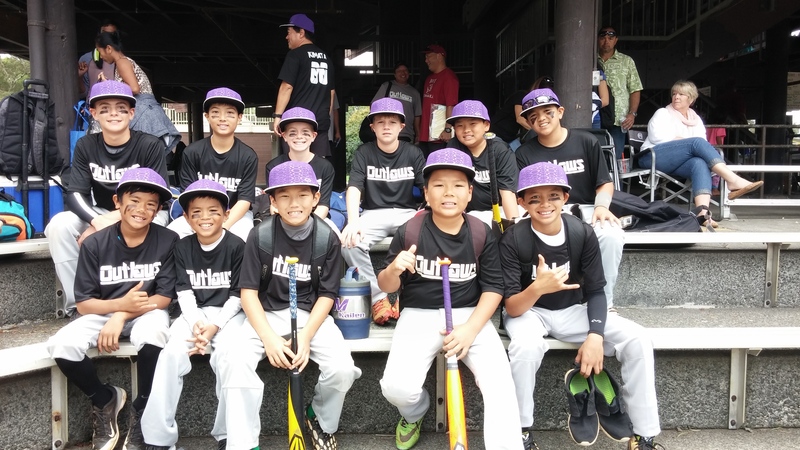 They were nicknamed the “Cardiac Kids” and became a crowd favorite as they rallied from 1 run deficits in the last inning in two tough games against tourney favorites Mililani Warriors and former New York Met, Benny Agbayani’s Mililani Mets! Both games ended in Hui ‘Aumākua hitting walk-off homeruns in the bottom of the 6th inning to conclude their run through the A Bracket! 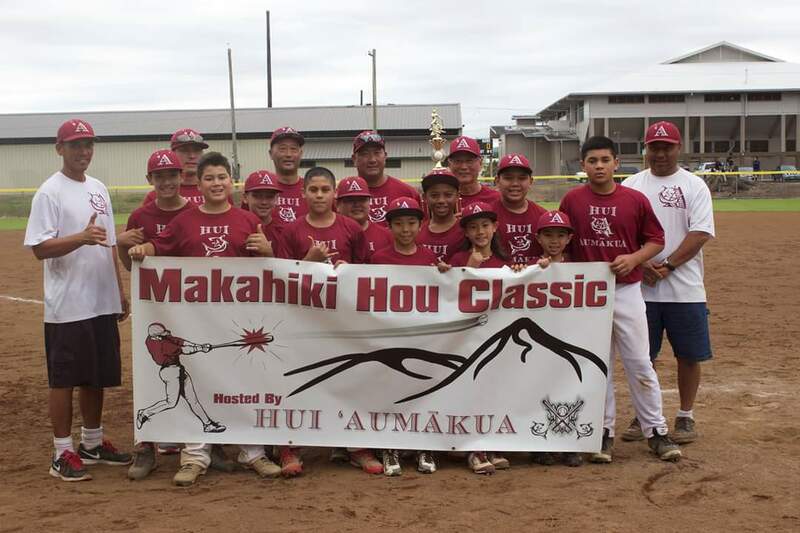 Hui ‘Aumākua will be hosting the finals of the 2015 Makahiki Hou Classic this weekend at Walter Victor Complex for the Pinto and Mustang divisions. Go check out some great youth baseball! The word makahiki can refer to a time of celebration, the ceremonies and activities observed during this particular time of year, or a complete calendar year. 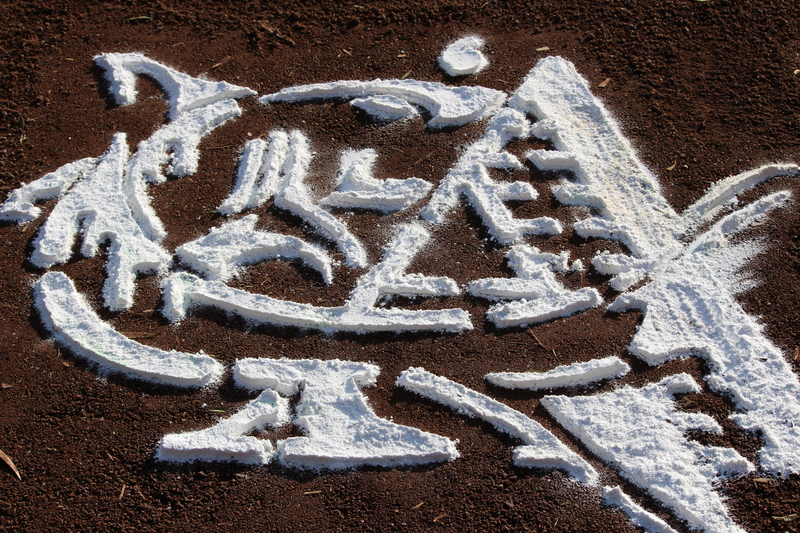 The period of Makahiki was a time of peace and plenty, relaxation and games. 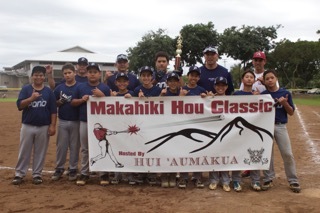 We invite you to join us, Hui ‘Aumākua and participate in baseball games in our 2015 Makahiki Hou Pinto Classic, January 24-25!